Has the change in season left you low on energy? As the days get shorter and the nights get longer, even the best of us can get a little down. The good news is that there are many natural ways to boost your mood and energy. At Garden of Eden, many of our favorites are products that use any of the citrus essential oils. You know how great you feel after a refreshing glass of lemonade or an juicy orange as a snack? The scents of orange, lemon, and grapefruit are known to be energizing and uplifting. In fact, according to a study reported in Prevention magazine, Brazilian scientists had participants spend five minutes inhaling one of three substances: sweet orange essential oil, tea tree oil, or water. The participants then underwent a stressful test while having their vital signs measured. Those who sniffed orange oil were less anxious throughout the test, and the beneficial effects even lingered once the exam was over. Citrus scents are not only invigorating, each citrus essential oil has its own unique properties that can benefit you in a variety of ways. Trying to lose weight? Try a whiff of grapefruit essential oil before sitting down to a meal. Prepping for a stressful exam or meeting? Rub a little base oil or lotion infused with lemon oil on the inside of your wrist to improve your performance. 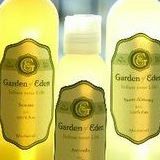 At Garden of Eden, we can custom-scent any of our private label products with your favorite citrus scent: bergamot, orange, grapefruit, lemon, or lime. It is important to know that citrus essential oils are photosensitive and can not be applied directly to the skin, which is why you must use a carrier base, such as a lotion, body oil, or shower gel. Looking for energy on-the-go? We also bottle each of the essential oils in 1/4 and 1/2 ounce sizes, perfect for keeping in a purse or bag. Then, for a quick midday refresher, moisten a cotton ball with a few drops of your favorite citrus oil and inhale. Any questions? Visit us in our St. Paul location at 867 Grand Ave., call us at 651-293-1300, or visit us online.